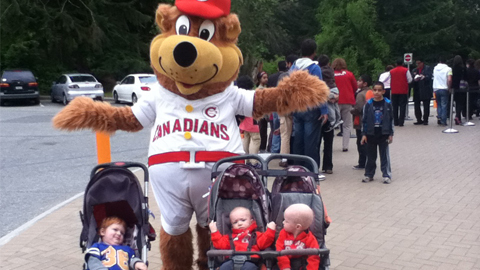 (Vancouver, BC) - Vancouver Canadians mascot Bob Brown Bear was thrilled to get a chance to attend 'Dreamnight', which is an annual event organized by the Vancouver Aquarium to share their facility with children that have life threatening illness. These brave young children along with their families got the opportunity to visit the Aquarium past regular hours and connect with the aquatic animals and exhibits. The night welcomed over 500 children and their families where they got to meet Bob, learn all about aquatic environments and animals as well as managed to see the famous Vancouver Aquarium dolphins and much more. Many of the children were from BC Children's Hospital and would not have had the opportunity to visit the Aquarium during regular hours due to their situation in the hospital. The Vancouver Canadians Baseball Club is proud to support local initiatives that give children the opportunity to enjoy life to the fullest. Our thanks and admiration to all involved for giving so many children the chance to create a new and exciting memory as they fight to stay healthy and positive.